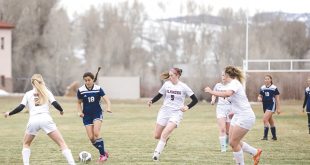 The Crested Butte Titans soccer team kept their hopes for a league title alive and secured a spot in the 3A state tournament with two wins last week over Bayfield and Pagosa Springs. It was a long week for the Titans with three games scheduled over four days. A win over Telluride on Tuesday, September 30 took its toll on the Titans, leaving them fatigued as they prepared for their game against Bayfield on Thursday, October 2. Junior Jenner Currier assuaged early concerns of how the team would play against Bayfield in the opening minute of the match, scoring on an assist from senior Jack Linehan. Bayfield struck back in the 23rd minute of the first half to tie the game 1-1, but the senior Robbie Holleran took the ball coast-to-coast in the 32nd minute to put the Titans back on top 2-1 by halftime. Senior John Wright added an insurance goal in the third minute of the second half and sophomore goalie Ben Frame came up with two brilliant saves to preserve the 3-1 Titans win. The win was not without its loss though as starting outside midfielder sophomore Henry Linehan left the game early with a broken wrist and would miss the next game against the Pagosa Springs Pirates on Friday, October 3. A win would earn the team an automatic bid to the state 3A tournament and keep their chance of a league title alive. A loss would be nothing short of devastating. While the Titans handed Pagosa a 5-0 loss earlier in the season, the Pirates are notorious for coming into Crested Butte and battling them into submission with over-the-top hustle and unfettered heart. 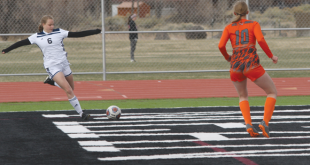 The Titans took the field prepared for the Pagosa Springs attack, nullifying the Pirates’ pre-game rally cry with a goal in the fourth minute. Wright found Jack Linehan open on the right side with a crisp pass and Linehan took one touch before blasting a left-footed shot top shelf. Wright added his own strike to the scoring 10 minutes later to put the Titans up 2-0, but Pagosa responded in the 22nd minute to cut the Crested Butte lead back down to one goal. Before Pagosa could seize on its newly found confidence, Wright scored again, threading through four defenders at the top of the penalty box to slip the ball past the onrushing goalie for a 3-1 Titans advantage. Five minutes into the second half, Linehan netted his second goal of the game when Wright pressured a Pirate defender to misplay a ball directly to Linehan’s feet. Linehan turned to the Pirate goal immediately and fought off a Pagosa defender to finish the one-on-one and build a 4-1 Titans lead. But the Titans grew weary, having played three games in four days and the energy drained from their legs and lungs midway through the second half. Pagosa capitalized on the Crested Butte lull to drain a shot from 30 yards out and then from three yards out to cut the Titans’ lead back down to one goal with 11 minutes left in the game. The two-goal attack served as a wake-up call for the Titans as they regrouped for the final stretch to hold the ball in Pagosa’s half of the field, firing shots on the Pirate cage. The back of the net proved elusive but the new surge offered relief to the Titans defense and Crested Butte held on for the 4-3 win. The victory improved the Titans league record to 8-1 and sets up a league title game on Thursday, October 9 at 4 p.m. in Crested Butte against the undefeated Ridgway Demons. The Titans lost to the Demons 3-2 in the first week of the season. A win for the Titans would result in a league title and a generous seed in the first round of the 3A state tournament. A loss would leave the Titans with yet another second-place finish and drop their state seeding down tremendously, forcing them to play one of the top teams in the state, if not the top team, in the opening round.